The University welcomes students interested in attending day or evening classes on a part-time basis (11 semester hours or fewer) and provides pre-admission counseling and academic advising as well as other services to meet part-time students’ needs. 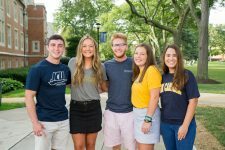 Based on any prior post-secondary coursework attempted or completed, students looking to attend part-time will apply for admission using either the Common Application or JCU’s Transfer application. To discuss your background and goals to determine which application to complete, please contact our enrollment staff at 216.397.4328 or jvelezharris@jcu.edu. Students are encouraged to consult with the Office of Admission about transfer of credit from other colleges and the possibility of earning advanced credit through CLEP examinations. Adults, 21 or older, who through personal study and effort may have developed the knowledge, understanding, and skills normally associated with certain college-level courses, may be permitted to earn up to 30 semester hours of credit on the basis of high achievement on the General and/or Subject tests administered by the College Entrance Examination Board in its College Level Examination Program (CLEP). The amount of credit granted will depend on the tests taken, the scores achieved, the degree program to be pursued, and the major field. Earned CLEP credit does not convert to letter grades and does not apply toward graduation honors. Students planning to take CLEP tests should consult the Office of Admission or their academic advisor. CLEP exams may not be used to fulfill the last 30 semester hours of credit. Students transferring from community colleges or other universities must meet the requirements specified for transfer admission. After notification of admission, transfer students are sent a list of all courses accepted and the corresponding number of credits awarded. Students interested in attending on a part-time basis are directed to the cost schedule for undergraduate courses. Students accepted for admission are required to submit a $100 non-refundable tuition deposit at the time of registration. Financial aid may be available for part-time students. The Ohio Part-Time Student Instructional Grant, Federal Pell Grants (full and part-time students), and Federal Stafford Loans (subsidized and/or unsubsidized loans for students enrolled for at least six hours per semester) are available to those qualifying students demonstrating financial need who file the Free Application for Federal Student Aid (FAFSA) and notify the John Carroll Office of Financial Aid. The unsubsidized Stafford Loan requires no demonstrated need. Students applying for Federal Pell Grants and/or Stafford Loans (subsidized and unsubsidized) must meet appropriate application deadlines. Finally, many employees return to school with the help of their employers through corporate tuition reimbursement programs. It is advisable to check with the respective corporate benefits officer for information regarding tuition assistance.